Sadie is faking things to get through life. She's part of the AE, her town's popular crowd, the Atwood Elite. Most of her social circle consists of bullies and Sadie does nothing to stop them. She does what she's being told to do. Shunning her neighbor and friend Ian, who isn't part of the AE, is the only option she feels she has. Sadie is traumatized and wants to spare herself the hurt of being harmed again, but her silence is starting to bother her more and more. Ian doesn't deserve what she's doing to him, he's been nothing but nice to her. When Ian's cousin Hayden comes into Sadie's life she loves him at first sight. He's from Waverly, a rural village that the AE doesn't approve of at all. Sadie has to make a choice, the AE or her own chance at happiness. Sadie tries to make amends for what she's done, but the leader of the AE, Britt, doesn't let her get away with it. She will make Sadie's life as miserable as she possibly can. Will Sadie be able to take that in exchange for real love? The bullying is going far, too far and Sadie's done with it. She wants to get out, but that isn't as easy as it seems. While Sadie tries to do what her conscience tells her to do for a change things are getting out of hand at school. The pressure is building and something is about to go horribly wrong. Will there be consequences for the AE this time and will Sadie be able to make things right before it's too late? 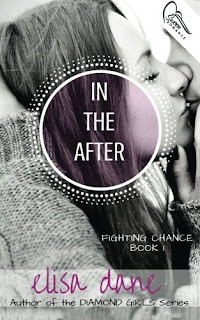 In the After is an emotional story. Sadie is severely traumatized and suffers from PTSD. She wants to stay safe whatever the cost. However, trying to remain on the good side of the popular crowd means that she's losing important parts of who she is. Sadie wants to change and I liked that she's taking responsibility for her own actions. She tries to make things right and she isn't afraid to admit she's made mistakes. That's what makes her a great main character. Sadie's personality has many different layers and that makes her really interesting. Hayden is a sweet guy who always does the right thing. He has a big heart and gets into fights because he stands up for the people he loves. He is caring and kind and is there for Sadie when she needs him. The bullying often made my heart ache and I'm glad that there is someone in the story who isn't afraid to speak his mind. Some scenes were almost too terrible to read and Hayden's presence is the only positive thing that brings some balance between the bad and the good. Elisa Dane writes about an important and difficult topic, bullying. The AE, especially Britt, does terrible things to the students of Sadie's high school who aren't part of the popular crowd. What happens in this book is raw and horrible, but there's also hope. Sadie wants to be good again and that comes with a price. I often felt bad for her and even though I could understand her fear I was glad she's finally able to see that what she condones is almost as bad as the bullying itself. I felt sorry for her because she's been through so much already and now she's living in such a terrible place. The AE made me feel sick, especially Britt. Elisa Dane has made her vile and insensitive, plus she's smart and manipulative, which is a scary combination. The writing is realistic and the tension keeps building until there is too much and things have to escalate. I loved Elisa Dane's controlled way of adding to the stress level bit by bit, trauma by trauma. Her writing is clever and intense. In the After is a very impressive story, a book you should definitely read if you like something dramatic and have a strong stomach. A very intriguing story line! Impressive cover, too! I really love the review and love to read more!!! Sounds great . Thank you for the review . Seems like an intriguing read! Bullying has become such a terrible thing in the past few years, and it can just devastate lives. I don't know if I could handle reading this book. The bullying plotline would upset me, but it needs addressing in pop culture!